A month of birthdays reminded the Prime of the pleasures of slowing one's roll and how the benefit of time really does improve things, namely, alcohol. And a white oak barrel doesn't hurt, either. A LUPEC meeting brought me back to the Woodinville Whiskey Company, but it was a previous visit 'wot truly done me in, as I'd visited earlier for a drive-by pickup of one of their age-your-own mini whiskey barrels, but more on that in a moment. Because it's time to sit back, relax, and let the good times pour. So first off, I realize the Seattle chapter of LUPEC (Ladies United for the Preservation of Endangered Cocktails - yes, this group exists, and it is awesome) meeting was earlier in May, but egads I've been backlogged on posts! 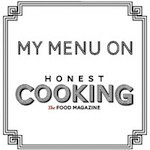 For all the best reasons, of course -- it's been a buffet line of too much good stuff. And the benefit of belated LUPEC-related posts is, it's a good reminder that there's always a meeting every month if you're in the Seattle area. You can keep up with the ladies on their blog, or get updates via their Facebook page. 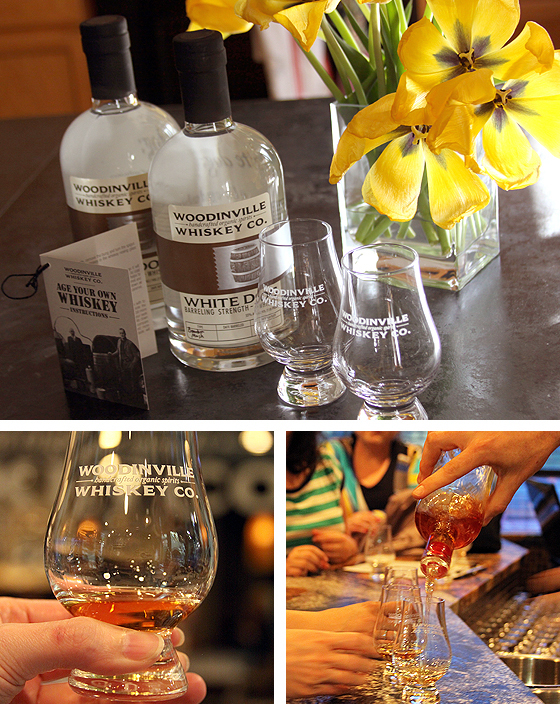 This last meetup in the Wood-hood of Woodinville was to sample the spirits of Woodinville Whiskey Company, and get a sample taste of an early draw from their barrel-aged whiskey. Jealous yet? You should be. 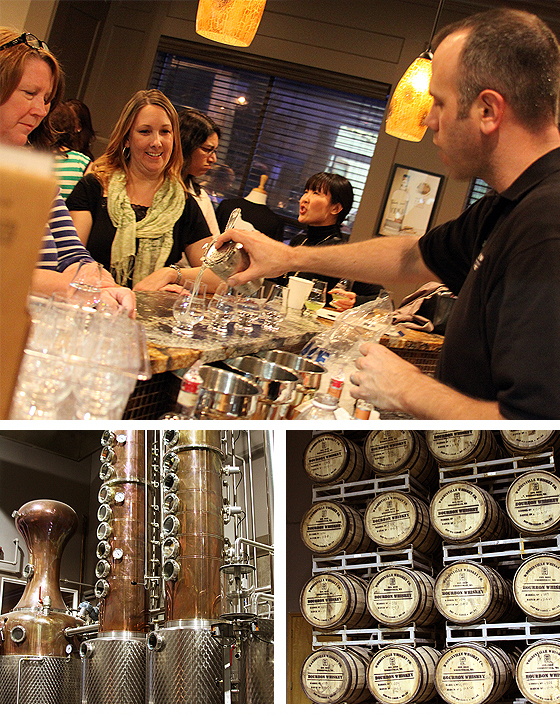 Co-owner Orlin Sorensen was on-hand to be master of whiskey ceremonies, giving a tour of the facility, showing off the impressive Wall o' Whiskey, as well as a resident mixologist, pouring tastes of the spirits and mixing up a special cocktail using their unaged Headlong white dog whiskey. Orlin summoned the Wondertwin Powers of Tom Cruise and Bryan Brown, a la Cocktail, and mixed up a drink called the Green Trellis that combined flavors of fresh cucumber, mint and apple -- sort of like a Washingtonian mojito, which went marvelously with their Headlong, as it has a crisp, clean flavor that hasn't taken on the smoky-vanilla notes from a barrel (yet). They serve this drink at Trellis, the restaurant downstairs from the Heathman Hotel in Kirkland -- one of my favorite spots. But Trellis isn't the only place that has Woodinville Whiskey Co's spirits -- next time you take a look at the bar's cornucopia of boozeahol,don't be surprised to see both the Headlong white dog whiskey, as well as their Peabody Jones Vodka, another nicely-made spirit, which I find very smooth and almost creamy. Fine on its own, but plays so nicely with other ingredients in the cocktail sandbox. It wasn't just drinks -- LUPEC ladies like to be educated, with a glass in hand. Orlin described all the unique aspects of what makes whiskey such a signature spirit and why bourbon is so gosh-darn all-American, given its requirements that include its production needing to be in the States, a grain mixture with a minimum of 51% corn and use of new/charred white oak barrels (which don't have to be American, interestingly enough). But of course -- what about the real Good Stuff? We saw the floor-to-ceiling collection of barrels aging whiskey, which in my mind, I heard the 2001 Monolith theme in my head. Just needed some monkeys freaking out, beating the ground with femurs. 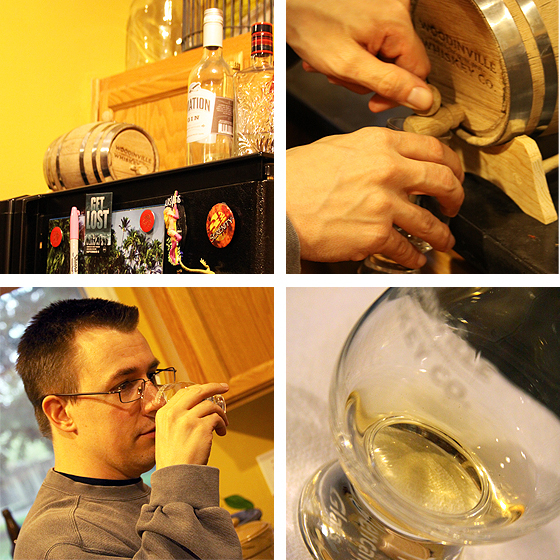 But the payoff was being able to get a little taste of the whiskey, straight from the barrel. Awww yeah. Even though it's not quite ready to graduate and sit on the shelf of liquor cabinets everywhere, the color was a gorgeous caramel, you get a lovely whiff of vanilla, and everything about it whispers great promise. It needed a little shot of water to simmer down the shout of, "Yo, we're still workin' here!" from the alcohol heat that hasn't quite tamed down yet, otherwise it feels like Mr. 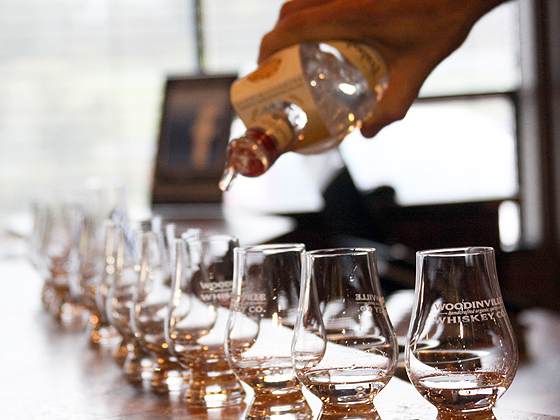 Whiskey just punched you in the face. But yes indeedy, there's potential in them thar oak barrels, and Orlin said to keep an eye on the cocktail horizon, as they should be seeing an official release in the near future. 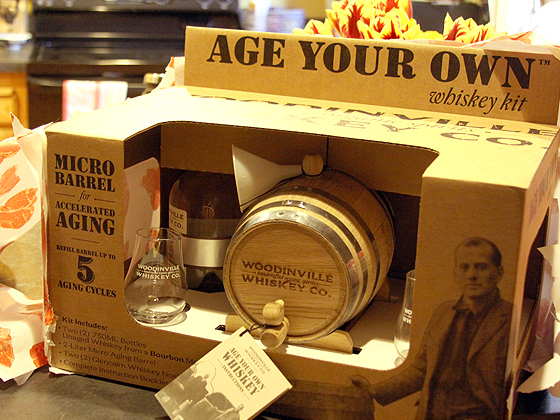 Woodinville Whiskey Co wisely created the coolest birthday/anniversary/holiday present ever, the Age Your Own Whiskey Kit, which includes two sipping glasses, a wee white oak barrel, and two bottles of melt-your-face-off high proof white dog that will eventually be tamed into warm, fuzzy, puppy love. I bought one of these fancy numbers for Mr. Wasabi's birthday, which unfortunately had to hide in my car for three days when he was home sick with a cold, before I snuck it into the house and then wrapped with paper printed with meat. When you care enough to send the very best, say it with alcohol and beef-decorated packaging. It's a pretty easy process, as all the complicated steps were taken care of by the distillery, they're just providing the unique tools that let you take over the finishing process of barrel-aged whiskey. Did they contract the Keebler elves to put together a cooperage to produce such ridiculously cute bitty barrels? Possibly. The crafting of these miniature barrels is pretty dang sweet, and the size is what also speeds up the aging process, as it increase the surface ratio of alcohol being in contact with the wood, so you don't have to wait forever and a day to get a roasty-toasty vanilla-y glass of whiskey. The instructions that come with the kit are pretty simple, so just read through it before immediately pouring your precious white dog into the barrel like a fool. Soak the barrel for a few days. Brock let his sit in the laundry room sink for 3-4 days, letting the wood grain swell and create a watertight seal for when the whiskey is added. When the barrel is ready, empty the water and swap with the firewater, and place in a spot where you're not tempted to poke at it or uncork the top every few hours, asking, "Is it ready yet??" Our resting spot of choice was above the fridge, which has a cacophony of magnets and crap on it to keep one's attention fully focused away from what's sitting atop it. 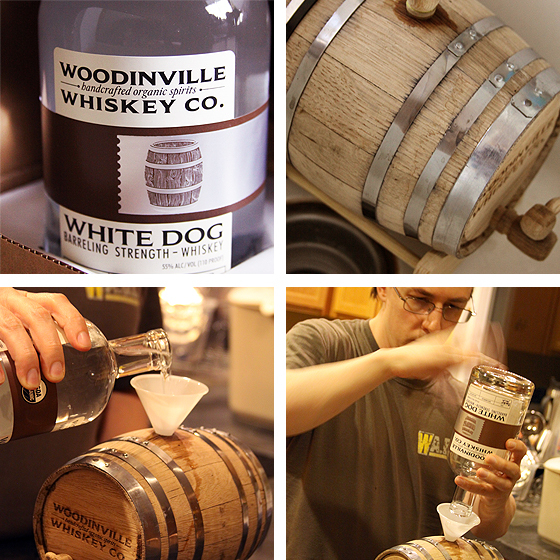 But we couldn't help take a sneaky-peeky at the whiskey two weeks into the process. It's amazing what just two weeks can do. The color was developing -- not a rich caramel yet, but the light amber tones were encouraging. You could already pick up notes of vanilla and it was starting to suggest a creaminess that you knew would only develop further with more barrel time. So what if we peeked at the presents before Xmas, just more to celebrate when the big day arrives. Will definitely do a post when that truly happy hour comes along, likely in another month or so. Stay tuned! can't wait to show my husband this post....he's a whisky lover!